The population of many countries in the world is exposed to earthquakes, one of the most destructive natural hazards. Sometimes, consequent triggered phenomena can be even worse than the earthquake itself. In this context, earthquake-induced landslides often concur in life and economic losses. To better understand these induced phenomena, updated catalogues of their types and location of occurrence are fundamental. In his works, Dr David K. Keefer performed several interesting statistical analysis, which highlighted how the magnitude and the distance from the epicentre play a key role in triggering earthquake-induced landslides (Figs. 1 and 2). In particular, he showed that the number of landslides induced by earthquakes decreases with the increase in distance from the epicentre (Fig.1) and that the number of landslide increases with larger magnitude events (Fig. 2). Fig. 1. 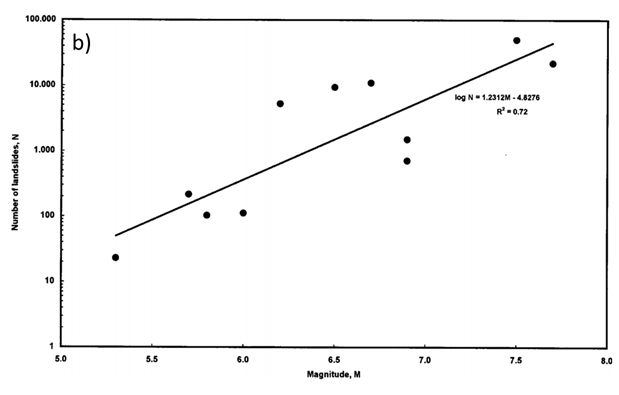 Relation between landslide concentration and epicentral distance for landslides in the southern Santa Cruz Mountains triggered by the 1989 Loma Prieta earthquake, California, from Keefer (2000). Fig. 2. Relation between total number of reported landslides and earthquake magnitude for earthquakes with comprehensive inventories of landslides, from Keefer (2002). What types of landslides can be induced by an earthquake? Keefer provided great insights about the types of landslides induced by an earthquake, showing that rock falls, rock slides and other types of landslide typically affecting the soil are usually abundant or very abundant in case of seismic events. Here, ‘rock’ signifies firm, intact bedrock while ‘soil’ signifies a loose, unconsolidated, or poorly cemented aggregate of particles. On the other hand, flow-like landslides result moderately common or uncommon (Fig. 3). Fig. 3. 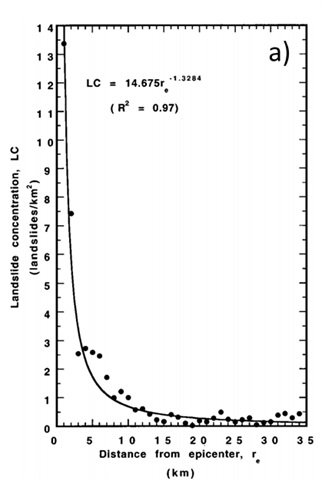 Relative abundance of earthquake-induced landslides, from Keefer (1984). 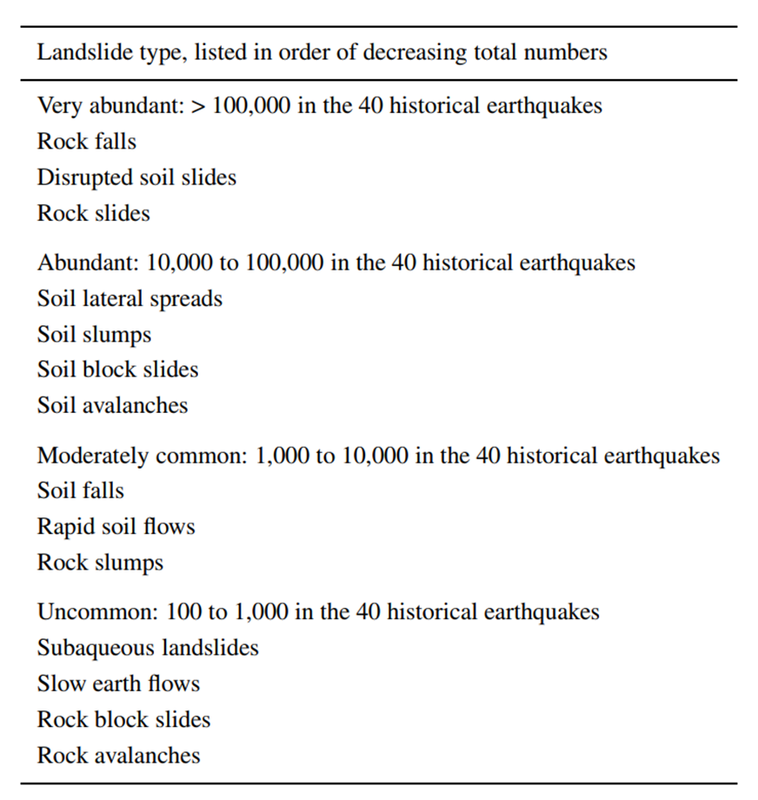 Skipping the definition of each above mentioned landslide typology, which can be found in Keefer (1984), it is important to notice that the most common types do not necessarily require an abundant presence of water to be triggered and some of them, such as rock falls, can occur in completely dry conditions. On the opposite, flow-like landslides mobilise material that is often, even though not always, mixed with water. In this context, rapid soil flows are the most hazardous ones since they move as high velocity currents and transport heavy rock boulders and trees up to several kilometres downstream. Videos of earthquake-induced landslides are available on the web (click on the underlined words to open the video). For example, this is a massive rock fall that occurred as a consequence of a Mw=6.5 earthquake that struck Central Italy on Oct. 31, 2016. These other rock falls, which channelized in steep narrow stream-valleys, occurred in Nepal on May 12, 2015 during a Mw=7.3 earthquake. You may have already read that on Sept. 6, 2018 the Hokkaido Japanese island was hit by a Mw=6.6 earthquake. 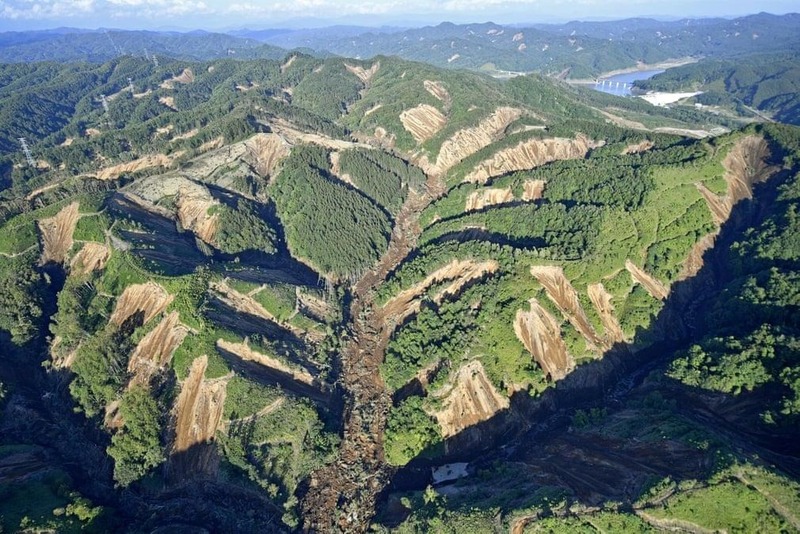 The earthquake generated numerous landslides in the Atsuma area, causing most of the 41 deaths attributed to the earthquake (Figs. 4 to 7, pictures taken from an article of The Guardian). 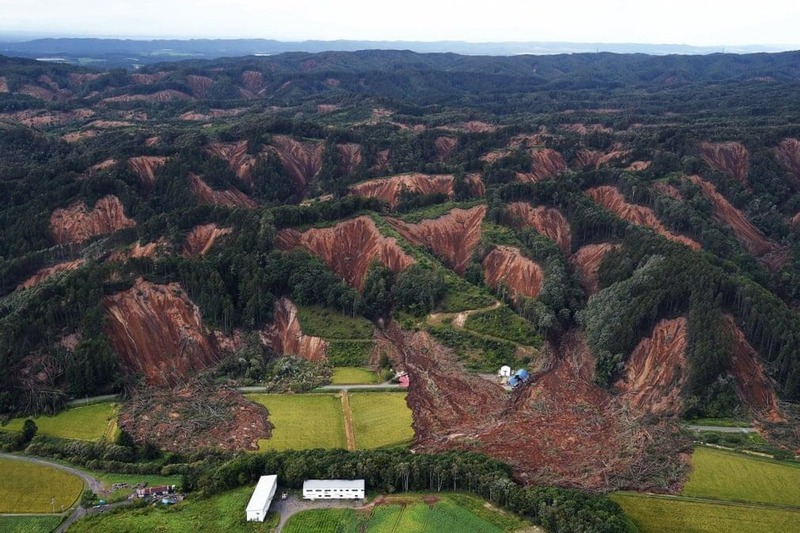 The landslides induced by the Hokkaido earthquake are quite different from the rock falls that can be observed in the above mentioned videos. By looking at the Atsuma pictures, it is easily recognizable that the mobilised material is mainly soil and it appears semi-fluid. Moreover, some landslides travelled a very long distance in a flow-like mode. These characteristics can make one think that the unstable mass was rich in water when the collapse occurred. The soil involved in the landslides, which to me correspond to rapid soil flows and water-rich soil slides, consists largely of layers of low density and high porosity tephra (pumice) ejected by past volcanic explosive eruptions in the region, as Japanese scientists refer to a local newspaper. Tephra layers can be easily mobilised by gravity, just like in this case. 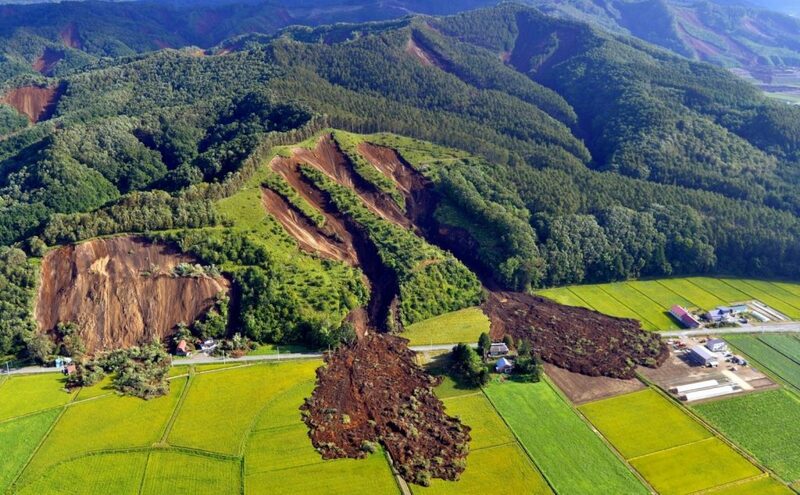 According to Yoshihiro Ishizuka, head of the volcanic activity research group at the National Institute of Advanced Industrial Science and Technology of Japan, the pumiceous soil moved alone while the stable bedrock below remained intact and in place. When I saw the pictures of Atsuma for the first time, I immediately thought that water could have played a major role in this tragedy. But where does this water come from? It is well known that earthquakes often cause soil liquefaction, is this the case? 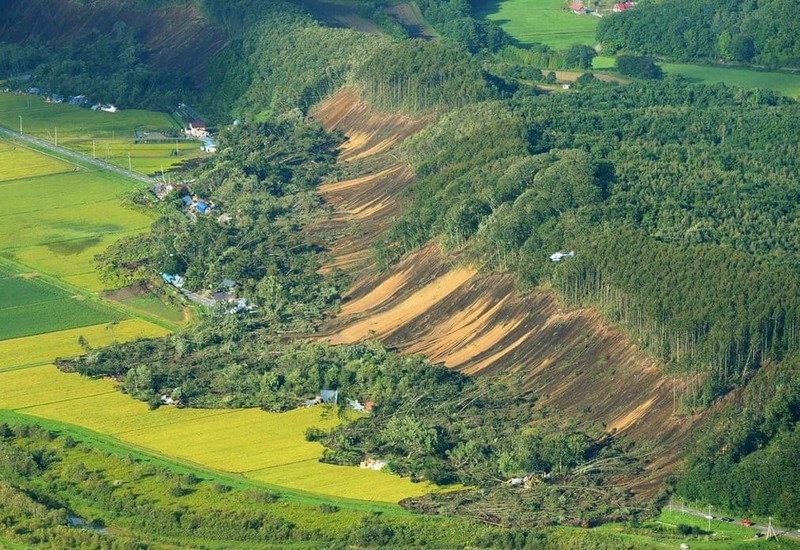 As a Japanese journal reported, it seems that the long, heavy rains of this summer may have contributed to fill the highly porous volcanic soil with water, facilitating the collapse and the trigger of the landslides when the earthquake hit the area. Nevertheless, others consider rains were too modest to represent an important causative factor. We will have to wait for further studies to solve the doubt!